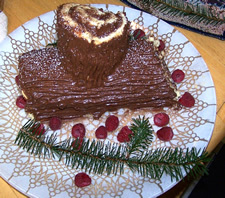 Are there any bakeries in the cap region that sell yule logs/ buche de Noel for Christmas? We had some vague memory that Mrs. London's in Saratoga makes BÃ»che de NoÃ«l (probably thanks to Ellen). So we gave them a call (581-1652 x303) -- and they do! Mrs. London's makes three types of BÃ»che, and each serves 10-12 people. They're $65 and must be pre-ordered and prepaid. Orders should be in at least a week before Christmas. And Mrs. London's is open until 4 pm on Christmas Eve if you want to pick up at the last moment. Has anyone had the BÃ»che from Mrs. London's? We'd love to hear how it is. And if you have a suggestion about other places for BÃ»che de NoÃ«l/yule logs, please share! I love these. Also I am a huge fruitcake fan. We've brought Mrs. London's Buche de Noel to several Christmas dinners, and they are always a huge hit. It's such a decadent concoction, yet somehow doesn't seem too rich after the traditional Christmas roast. To add to the merriment, you should add some sabayon (rum infused whipped cream). Not cheap, but the presentation always elicits a "wow" from the crowd, and it's delicious the next day, too! The Placid Baker, at 250 Broadway in Troy, had an amazing BÃ»che de NoÃ«l last year. We enjoyed it for several days and it didn't dry out. I don't know if they are planning on making them again this year, but you can call them at (518) 326-2657 and ask. I am a chocolate lover! That cake looks so good. I am looking for seven layer cake, the kind that Joe's Restaurant on Madison Ave used to have. It had alternate mocha frosting, with dark chocolate frosting on top, and pistachios sprinkled . Does anyone know of a place in the Capital region that makes La Tourtiere, a French Canadian pork pie? I had a magnificent Buche de Noel from Crisan at my nephew and niece-in-law's on Christmas Day - almost too beautiful to cut, but it was out of this world. Everyone took pictures of it first, and then we savored every delicious delectable bite. Thanks Crisan (and Jeremy and Laura) for the Christmas treat! Tres jolie and tres tres bien!